Looking for a safe, engaging and fun activity day? An EOTC trip a Adventure Forest stimulates students to challenge their balance, build up confidence, develop safety awareness, support each other and be proud of their achievements. 12 Levels, 100s Challenges, 30 Flying Foxes! The session is organized with small groups to allow each student to make the most of the experience. No crowd, no queues, more action. Our team of enthusiastic instructors leads them through the safety briefing, advises on the different courses, and patrols the park to support and assist any participant when necessary. 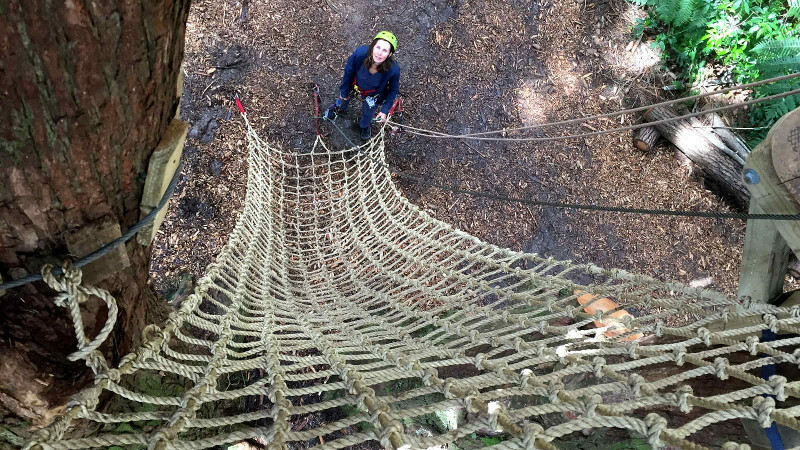 All courses are equipped with a Continuous Belay System. Unique in New Zealand, this feature eliminates the risk of participants accidentally detaching themselves from the lifelines and enables to focus on learning outcomes. Safe, smart and simple. We are proud to run a very safe operation with no accident since its opening in 2008. Independent Safety Audits are conducted each year. Registered with WorkSafe, certified Outdoorsmak and Qualmark. The park is nested at the entry to the Glenbervie Forest with its large large network of trails for your walking, orienteering or mountain biking project. Love it here! Whangarei offers stunning natural features, a wide range of affordable accommodations and other quality land or water-based activities. Contact us, we’d love to help you organising an unforgettable school trip. Please click here if you want to book for a business event or there if you are an individual or a family group.